A simple touch makes life that much easier. Whether you have two full hands or 10 messy fingers, Delta Touch2O Technology helps keep your faucet clean, even when your hands aren’t. 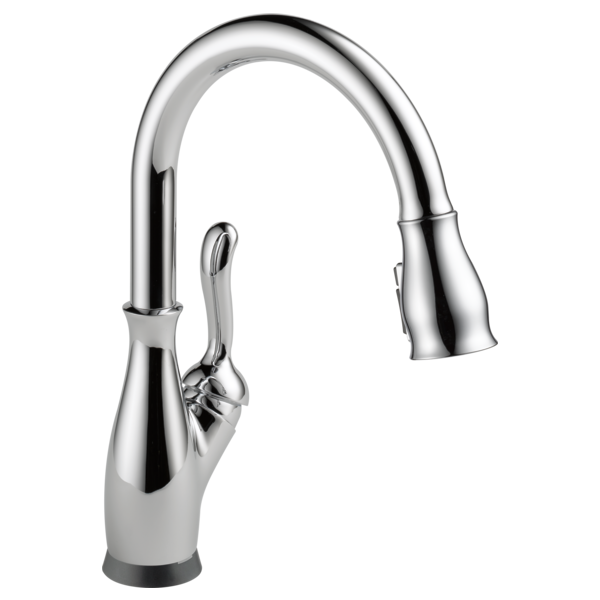 A simple touch anywhere on the spout or kitchen faucet handle with your wrist or forearm activates the flow of water at the temperature where your faucet handle is set. The Delta TempSense® LED light changes color to alert you to the water’s temperature and eliminate any possible surprises or discomfort. 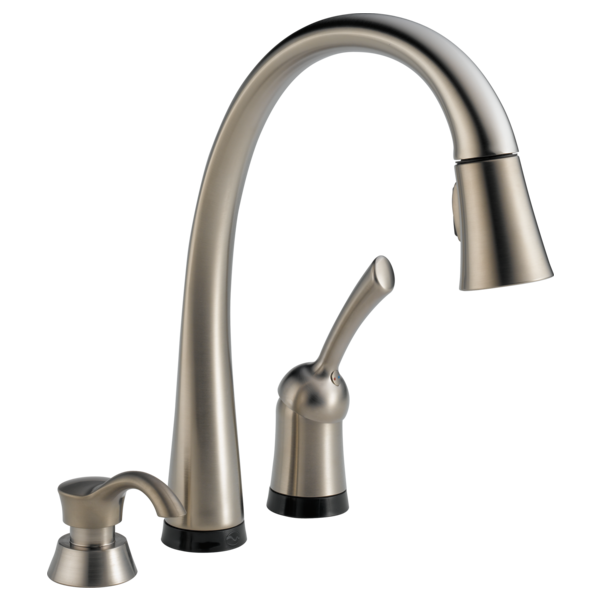 Experience the convenience and control of Delta kitchen faucets featuring Touch2O Technology. Cleaning your faucet just got easier. If your shower head or faucet has Touch-Clean spray holes, removing mineral deposits requires nothing more than a swipe of a finger. Put away those chemical cleaners of yesteryear and embrace modern efficiency. Sleek, refined, minimalist and statement making. 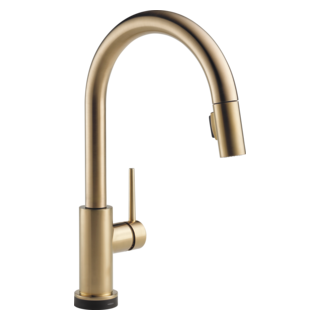 Paired with the best technologies, this faucet's profile is both stunning and stately. 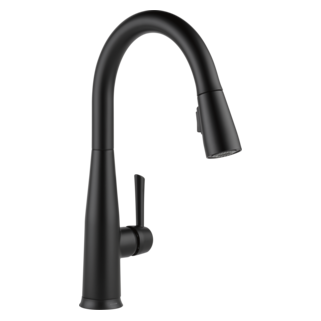 The elegance of the Matte Black finish will take your kitchen's design to the next level of style. It's comforting to know that some things will stay exactly where you left them. For Delta faucets with MagnaTite Docking, this means having a spray wand that snaps into place after each and every use. The powerful magnet used in this technology ensures your wand won't droop over time. You can't see DIAMOND Seal Technology but you'll know it's there by the superior way your faucet performs. DIAMOND Seal Technology uses real diamonds to engineer a product that is leak-proof for the life of the faucet. Like most things, it's what's inside that counts. With Touch2O Technology, it only takes a small touch to make big things happen. When your hands are full, a quick touch with your forearm will activate your faucet. Touch2O Technology will help keep you from spreading the mess from your hands to your faucet. It's an innovation that will enhance and simplify your life. Now see what Delta Touch2O.xt Technology can do in the bath. Wish I bought one years ago. I have had this faucet for about a year and like it more each day, especially the fact that you can touch it almost anywhere with your finger, wrist, elbow, whatever! 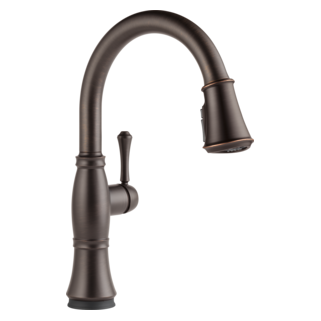 Keeps more water in the sink and not on the counter where the typical faucet control is located. I had a professional install the faucet and it was worth the money, as the old faucet was very difficult to get out. We had to fiddle with the wires under the sink on the new faucet to make sure they were in the right places, which turned out not to be a big deal as they are only attached to a small battery pack. Once we figured that out everything worked well. Delta quality is reassuring for a longtime investment like this kitchen tool (your faucet) that is used so frequently! It’s beautiful, works reliably, has NOT leaked or failed us in the year it has been installed!!! We love this faucet! It is great when your hands have poultry on them or mixing meatloaf and you don't want to touch a handle with your hands. Love the 4 minute shut off also! It has been easy to clean too! The only issue we have had is if you reach behind the faucet and accidentally tap it the water will start and sometimes your arm is right under it. How do I turn the faucet off and on? You may choose to operate the faucet as you would any standard single-handle faucet by moving handle to the on and off positions. You may also tap it on and off with a deliberate touch, like that of a mouse click on your computer. Does the faucet need to be plugged in to an outlet? No. Touch2O® and Touch2O.xt™ Technology faucets are powered by batteries, which are included in the box. An optional A/C adapter (EP73954) is available for purchase should you want to connect the faucet to a grounded, 3 prong electrical outlet. Are there any safety concerns for my family and I, mixing water with electronics? Delta® faucets featuring Touch2O Technology use the same touch sensing technology commonly found in smart phones today. The system operates on 6AA or 6C batteries, which uses a low DC voltage. The optional A/C adapter (EP73954) electrically isolates the faucet from the household electrical wiring. Will I need an electrician or plumber to install a faucet or soap dispenser featuring Touch2O products? No. The installation process is just like installing a regular faucet with a few additional components. The faucet ships with 6 AA batteries and can be powered with 6 C batteries if you do not have a grounded outlet. An A/C adapter (EP73954) is available for purchase should you want to connect the faucet to a grounded, 3 prong electrical outlet. With Delta® DIAMOND™ Seal Technology, the integrated supply means everything you need is included in the box. If the faucet is left running or activated by my child or pet, will it stop automatically? 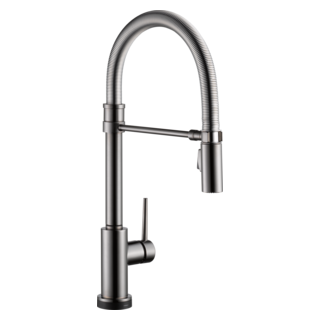 Should your Delta® Touch2O Technology faucet be activated accidentally, the faucet has an automatic shut-off feature that will stop the flow of water after four minutes of no activity. Will the faucet turn on and off if I try to pivot the spout or adjust the temperature? No. Delta® Touch2O Technology is a sophisticated technology that can distinguish the difference between a tap and grasp by measuring the duration of the contact with the faucet. Touches are defined as being less than 300 milliseconds, whereas grabs are more than 300 milliseconds. 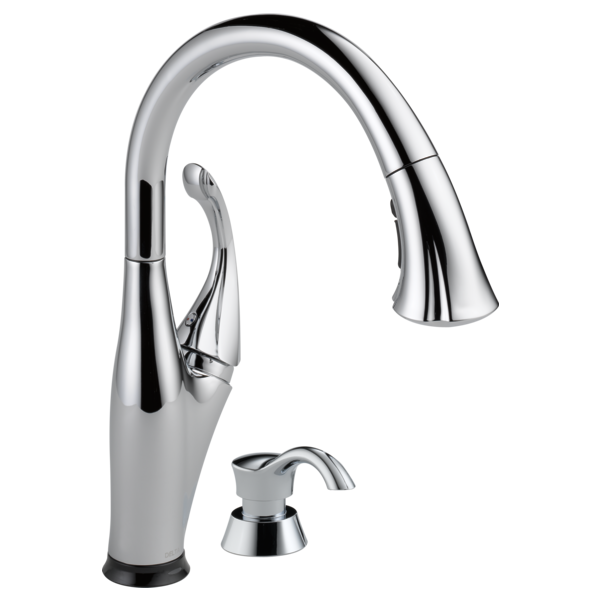 If you have questions about Touch2O faucets, even before you purchase one, we are here to help.